Welcome to a new column for and about veterans, active duty military, and families of both — presented by the Pierre Claeyssens Veterans Foundation. We will have news of interest to all and a listing of upcoming events honoring veterans. We also will have profiles of local veterans and active-duty military. And there will be tips and information for veterans on how to deal with the Veterans Affairs Department. On June 12, at the Santa Barbara Veterans’ Memorial Building, veterans groups organized the first “Welcome Home Veterans Dinner Dance,” enjoyed by all in attendance. Country Catering Meat Market & Deli did the tri-tip and chicken dinner, and the Drive-In Romeos from Santa Maria played music of all eras. There will be another dinner dance in the fall so stay tuned to this column for the date. 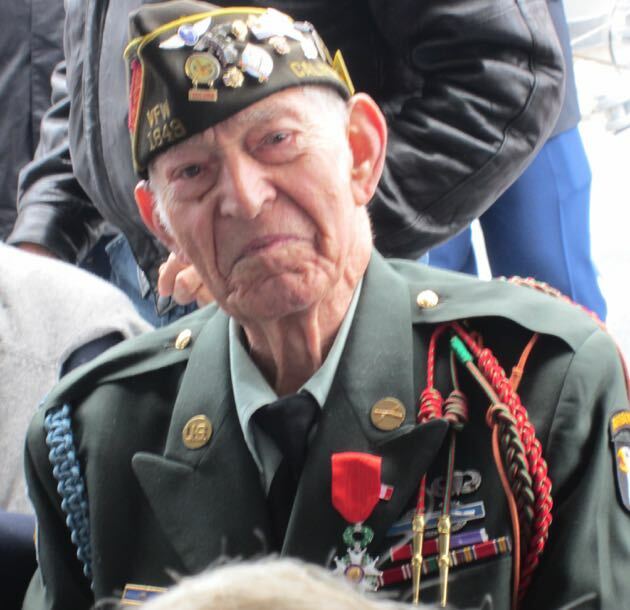 On May 11, on board the USS Iowa, a World War II battleship berthed in San Pedro, Art Petersen received France’s highest honor for serving in the D-Day invasion of Normandy. 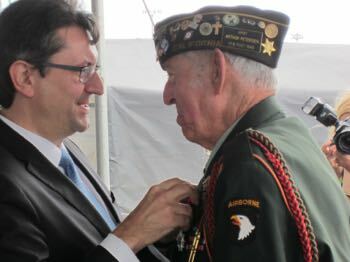 French Consul General Axel Cruau bestows the French Legion of Honor Award to Art Petersen of Goleta. The Goleta resident met the French consul general at the Channel City Club luncheon/symposium done in collaboration with the PCVF commemoration of the 70th Anniversary of D-Day in 2014. The pleasure of your company is requested at the presentation of the insignia of Chevalier dans l’Ordre National de la Légion d’Honneur by the Consul General of France in Los Angeles, Mr. Axel Cruau. On the Battleship USS-Iowa BB-61, Berth 87. Art is a member of the Military Order of the Purple Heart, Veterans of Foreign Wars, Disabled American Veterans and the American Legion. He was a member of the Screaming Eagles, 101st Airborne Division and made two combat jumps in the D-Day invasion in 1944. He was awarded two Purple Hearts, a Combat Infantryman Badge and a Bronze Star. Born in Mexico City, Art was like many immigrants who wanted to fight for their new country. He was hastily naturalized in a ceremony in London shortly before being deployed to fight in Europe with the 101st. Gloria Petersen, who married Art after WWII, was in attendance as were members of the Petersen family. It was a moving ceremony and the French got it right. Forms go out of date when they are replaced with new versions. Check your current version of key forms, such as Power of Attorney and Survivor Benefits. Do not deal with the VA on your own. Have an interface of a recognized veterans group or a Santa Barbara County veterans service officer. Shortly after the 1941 attack on Pearl Harbor, Americans rallied like never before. WWII was now a personal fight. Our U.S. government saw the need to build airports that could convert to military use should war become a reality. The idea was to share costs with the local governments. The City of Santa Barbara enrolled in the program. and groundbreaking ceremonies were held that same year for the Santa Barbara Municipal Airport. At the outbreak of WWII, the airport was designated as Marine Corps Air Station Santa Barbara to be a Marine aviator-training base. The air station roster included 500 officers, 3,100 enlisted men and 440 enlisted women. It reverted to a civilian airport in 1946. Today, substantial portions of the former air station are home to the Santa Barbara Airport and to the campus of UC Santa Barbara. This is a short synopsis of the history this column will explore in future installments. One source for this history is based on the declassified documents and records recorded by the Marine Corps Air Station during the years 1942 to 1946. Local historian Adam Lewis uncovered the declassified documents. This continuing education history lesson will also include the beginning histories of local businesses that are household names and prospered because they got their start during this era of the U.S. Marine Corps air base. Wednesday, Sept. 9: The Pierre Claeyssens Veterans Foundation and the Channel City Club are collaborating on a presentation called Vietnam: The War and Its Veterans 50 Years On. Vietnam War veterans will tell their stories along with a concise history of the war. Facts, fiction, films and music of the era will highlight the personal stories. The event will be held at The Fess Parker, 633 E. Cabrillo Blvd. in Santa Barbara, from 11:30 a.m. to 1:30 p.m. Tickets are $40 each. Click here to make reservations online, or call 805.564.6223. Click here for more information about Vietnam: The War and Its Veterans 50 Years On. Have any events coming up that should be included in this column? How about items of interest to veterans or active-duty military or the families of both? Click here to email us at Noozhawk. Click here for more information about the Pierre Claeyssens Veterans Foundation. Connect with the Pierre Claeyssens Veterans Foundation on Facebook. — Lt. John W. Blankenship (retired) graduated from UC Santa Barbara and the naval flight school in Pensacola, Fla., in 1965. He flew T-34s, T-28s, S-2s and finally the P-3C Orion Aircraft with VP-19. Blankenship was stationed in Iwakuni, Japan, and then in Cam Ranh Bay, Vietnam. In 1970, he returned to Santa Barbara to start his career in building and construction, retiring in 2008. He became the founding director of the Pierre Claeyssens Veterans Foundation in 2004. Ten-HUT is a biweekly column for veterans, active duty and families presented by the PCVF. The opinions expressed are his own.